Sunday Hotel Rhodes is a luxurious, family friendly hotel situated in Lalyssos just 5 minutes away from the beach and 6km from the Rhodes Town. Amidst tranquil surroundings and lush gardens, the three generations family-run hotel features a swimming pool, sun terrace and a snack bar and invites guests to enjoy a comfortable stay with modern amenities and warm hospitality. Well-appointed, air conditioned guest rooms come with a safe, satellite TV, a well-equipped kitchenette, dining table, fridge, cooking hobs and coffee machine. 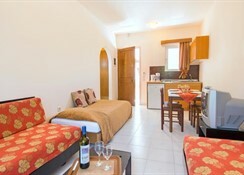 They have a private balcony overlooking the pool or the garden and make guests feel like home while on their holidays. The hotel is just 400m from the Lalyssos beach, and can be reached with a leisurely stroll. The Rhodes Town and Port are located 6 km respectively from the hotel. The Ammoudes beach is at 16 km, a 20 minutes’ drive. Sunday Hotel Rhodes is 7km from the nearest airfield, Diagoras International Airport. Free public parking is possible nearby. Sunday Hotel Rhodes offers contemporary, well-appointed guestrooms renovated in 2018 in categories like Studio, Apartments, Maisonettes and Family Maisonettes. 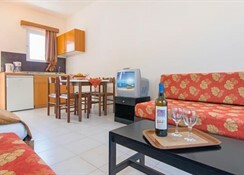 The air-conditioned rooms a safe, satellite TV, Wi-Fi, a well-equipped kitchenette, dining table, fridge, cooking hobs and coffee machine. The en-suite bath has shower and bath amenities. They also have a private balcony overlooking the pool or the garden. Guests at Sunday Hotel Rhodes can recharge themselves with continental breakfast is served daily at the dining area. It has an on-site restaurant serving Mediterranean flavours for lunch or dinner. Kid’s meals and special diet menus are available on request. Guests can also order a fresh juice or cold coffee from the lovely snack bar at the pool area. 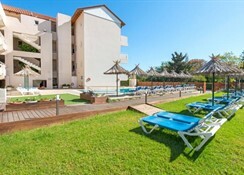 Sunday Hotel Rhodes has a swimming pool and kids’ pool and terrace where guests can soak up all the sun. There is Yoga classes and a fully equipped gym for those who wish to stay active. Many massages and therapies area available on request. Tiny tots can have fun at the library with fun DVDs and board games. The hotel has facilities for Games Room and Billiards. The hotel can arrange diving, windsurfing, bike rentals and sailing. There is lively themed dinners and sports events screening too.